On the night of 14 November 1940, the city of Coventry was devastated by bombs dropped by the Luftwaffe. The Cathedral burned with the city, having been hit by several incendiary devices. The competition to design the new cathedral was won by Basil Spence, and HM The Queen laid the foundation stone on 23 March 1956. Gifts and donations flooded into Coventry, to commission works of art and to sustain future ministry. In keeping with tradition, the cathedral was to be filled with art from the leading artists of the time. The well dressing shown here is based Graham Sutherland s tapestry of Christ in Glory in the Tetramorph, and it dominates the East End of the cathedral. 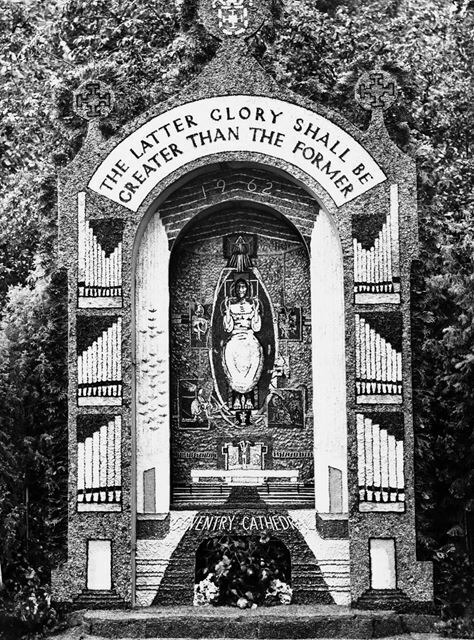 The new cathedral was consecrated on 25 May 1962, in the presence of HM The Queen, and this well dressing was done in the same year.